Among food historians, the history of strawberry shortcake dessert begins around 1847 in the United States. 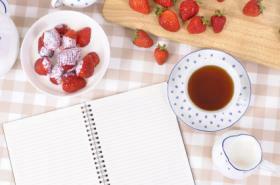 The first found recipe is in Miss Leslie's Ladies New Receipt Book for "Strawberry Cake". However, the "strawberry cake" is very similar to what is known today as "strawberry shortcake". Strawberries have been around for more than two thousand years--there are records of strawberries eaten as food as early as Ancient Roman times. Strawberries probably grew in the wild in Europe. Shortcake on the other hand, was a European invention. Technically shortcake is (and has always been), a rich biscuit. True shortcake uses baking powder for leavening, and is mixed with shortening (or butter) eggs, cream a little sugar and of course flour. While no one is sure exactly when the idea to combine shortcake and strawberries took hold, food historians generally agree that the idea of strawberries and shortcake together is the creative genius of cooks in the United States. While it can be presumed that strawberry shortcake was probably enjoyed earlier, the earliest recorded recipe is found in Miss Leslie's Ladies Receipt Book, published in 1847. The recipe is for something called "Strawberry Cake" but its strikingly similar to what most understand as strawberry shortcake. One thing that can be seen from following the history of strawberry shortcake: dessert evolves substantially over time. The strawberry cake of Miss Leslie's day looks quite different than what you might expect to find today. Strawberry shortcake has always, at heart, been a dessert with some type of cake or pastry and strawberries. The first strawberry shortcakes were made with heavy pastry that was somewhat similar to pie crust but a little thicker. The crust was baked, then split apart and filled with strawberries that had been mashed and sweetened. The strawberries were put in between the two "crusts", to make sort of a sandwich. Then, as was the tradition of the day, the whole thing was covered with a sugared frosting. Probably the closest thing to Miss Leslie's original strawberry "cake" is strawberries over biscuits. 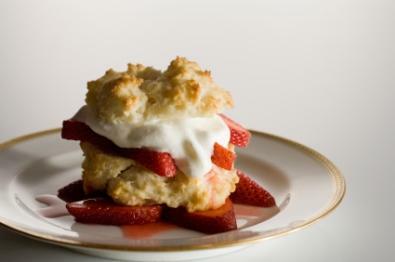 As "strawberry shortcake" parties were popular in the late 19th century, chances are that the biscuit recipe evolved according to individual tastes and ingredients available. Food historians are not entirely sure. At some point the icing was replaced with whipped cream, and the biscuits replaced with sponge cake, angel food, or even puff pastry, to yield the modern version of what is commonly known as strawberry shortcake. While the origins and evolution of strawberry shortcake are somewhat uncertain, the popularity of strawberry shortcake is undeniable. As spring (and more importantly strawberry season) abounds across the country, there are actually places that are famous for none other than their strawberry shortcakes. Check out some of these strawberry shortcake history makers. Parksdale Farm Market in Plant City, Florida, not only has made noteworthy strawberry shortcak history, but continues to be noted as one of the best places in the United States to get the delicious dessert. If you are expecting a super fancy presentation on fine china, then you will be sorely disappointed. However, you can expect delicious sponge cake, piled high with strawberries and a mountain of whipped cream. You can also expect a lengthy line most times during the year. People wait for hours just to try Parksdale's offerings. Wilson farms in Lexington, Massachusetts is noted as creating history by making a 3,560 pound strawberry shortcake. . .from scratch. They held the record for a little over a month, until a larger strawberry shortcake dessert was created in Sweden. Unfortunately, it was not recorded as to how many people it took to eat that huge dessert! Whether you are a purist or are open to less traditional strawberry shortcake desserts--it is undeniable that strawberry shortcake is an American tradition.